A leaked internal memo, obtained by EURACTIV, gives a rare glimpse into the communication strategy of Europe’s main business lobby group ahead of the COP24 conference later this year, showing how it plans to “oppose” any increase in the EU’s climate ambition for 2030. The memo from BusinessEurope, dated 13 September, shows how Europe’s biggest employer association intends to “challenge” EU plans to aim higher in the fight against climate change. The document, which will be discussed at an internal meeting on Wednesday, says the main line to take about the EU’s climate policy should be “rather positive, as long as it remains a political statement with no implications” on the EU’s existing commitments under the Paris Agreement. 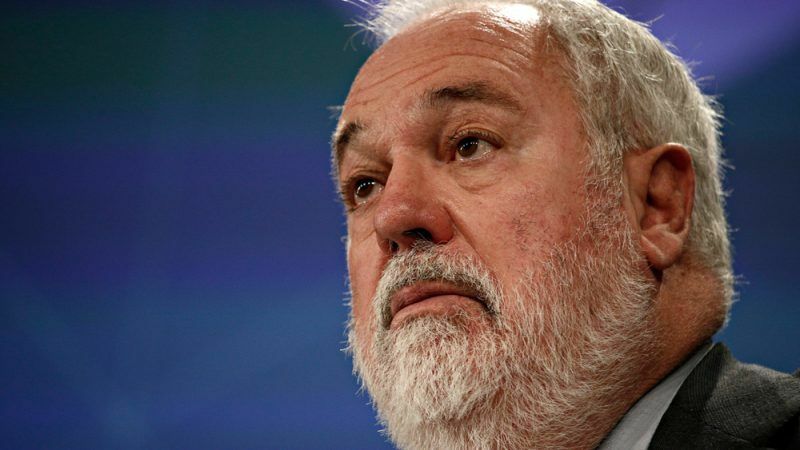 Miguel Arias Canete, the EU climate action commissioner, has suggested updating the EU’s greenhouse gas reduction target for 2030, arguing that the EU’s level of ambition had “de facto” been raised after an agreement was struck on renewables and energy efficiency targets earlier in June. Currently, the EU envisages cutting its emissions by “at least 40%” by 2030 based on 1990 levels. That target would effectively be raised to 45% following the deal on renewables and energy efficiency, Cañete said. 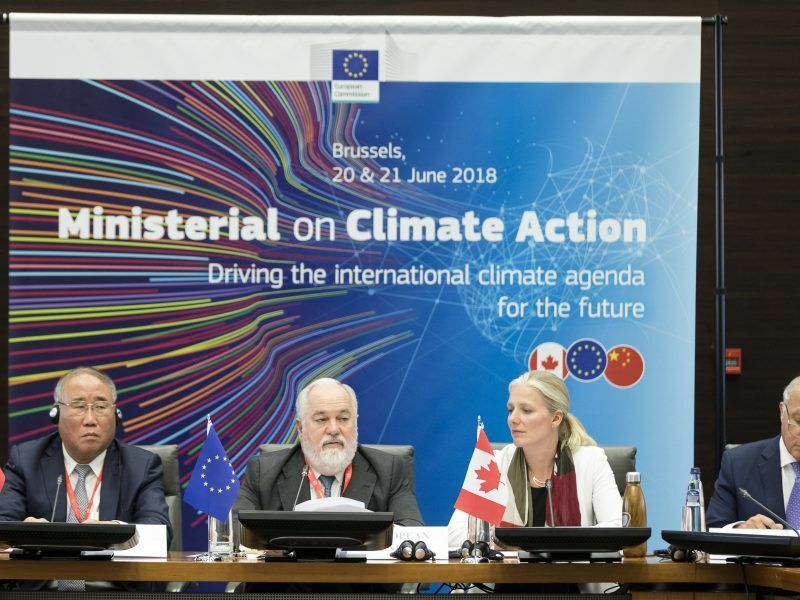 The EU’s top energy and climate official revealed on Wednesday (20 June) that the bloc is now set to increase its emissions reduction pledge from 40% by 2030 to 45%, after EU negotiators sealed agreements on three clean energy laws in the past fortnight. That was later backed by Commission President Jean-Claude Juncker, who said in his annual “State of the Union” address to Parliament that it was “scientifically right” to raise the EU’s climate goals. 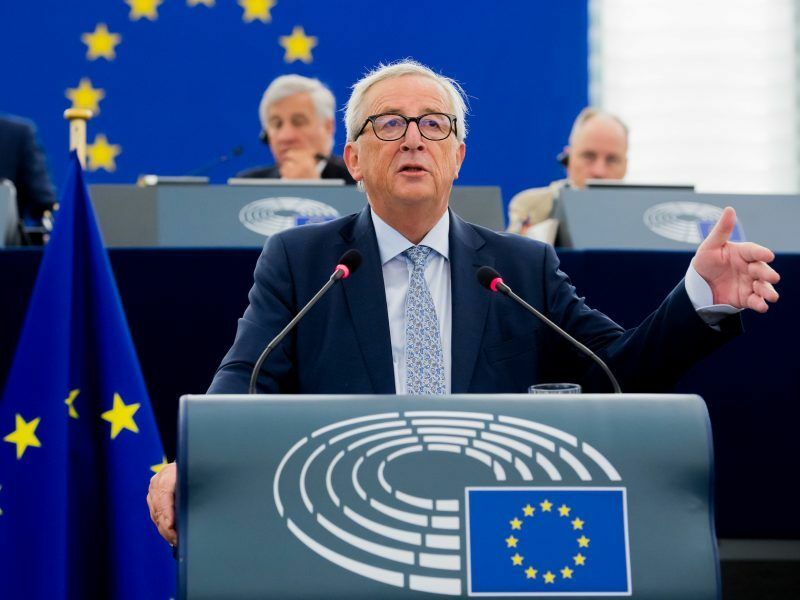 European Commission President Jean-Claude Juncker urged the European Union on Wednesday (12 September) to raise its goals for limiting climate change, but did not mention the forthcoming 2050 strategy. EURACTIV’s partner Climate Home News reports. But Germany is sceptical of any such move, fearing for the competitiveness of its export-dependent industry. 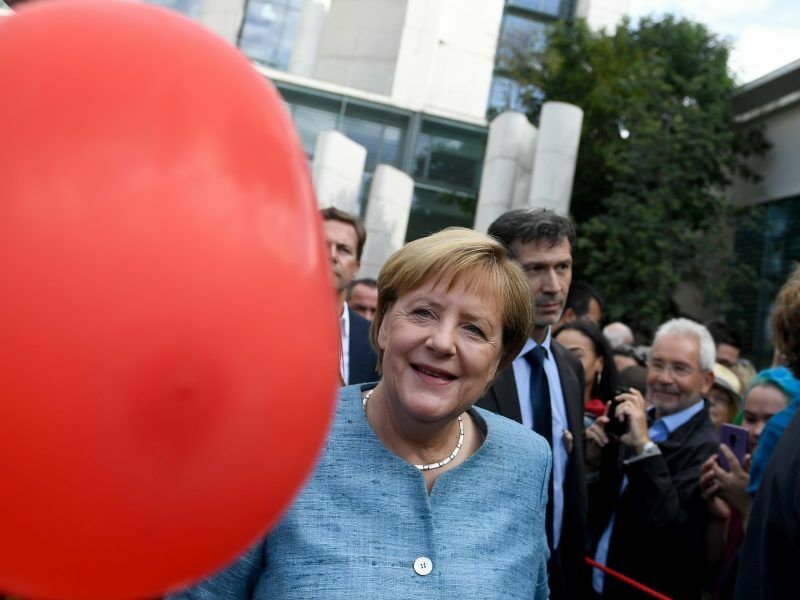 In August, Chancellor Angela Merkel spoke out against revising the EU’s climate objectives, saying “we should first stick to the goals we have already set for ourselves”. The internal memo from BusinessEurope follows the same line, recommending “to oppose the new increase in ambition, using the usual arguments” that Europe cannot take action on its own, and should seek a level playing field with global competitors before making any moves. It suggests “to minimise the issue” by arguing that raising the ambition “is not what matters most. What is key is to persuade other major economies to catch up with the EU’s ambition,” the memo argues. BusinessEurope also recommends “to challenge the process” by asking for more cost-benefit studies and requiring “more transparency on the calculations”. Tara Connolly, a climate campaigner at Greenpeace, denounced the “political manoeuvring” by BusinessEurope at a time when Europeans are “feeling the devastating effects of climate change first hand” – with a summer heatwave and drought that saw the EU dig deep to bail out helpless farmers. “The European Commission has a responsibility to move forward and ignore the spin, the lies and the delaying tactics of Europe’s dinosaur corporations. It would be irresponsible to fall for this scaremongering and ignore the huge economic, health and environmental damages of climate change,”Connolly said. Germany has a track record of challenging the EU’s climate ambitions. 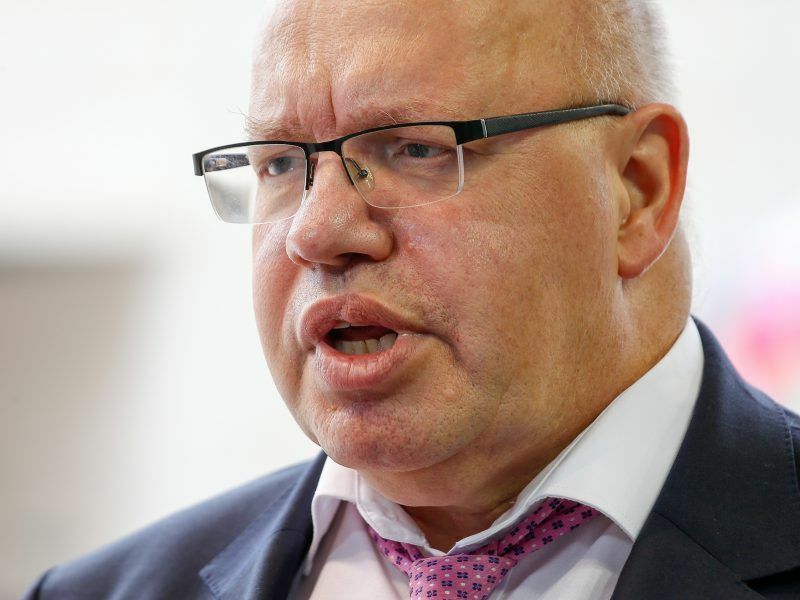 In June, German Energy Minister Peter Altmaier rejected calls from a group of other EU countries to boost the share of renewables to 33-35% of the bloc’s energy mix by 2030. I hope nobody minds a duplicate of a previous comment; I think it is worth mentioning the specific direction needed and where some focus should be placed with regards to strategy going forward. As is discussed in detail in a previous Euractiv report (euractiv .com/section/electricity/interview/academic-fossil-fuel-back-ups-may-be-the-price-to-pay-for-renewables/), for a meaningful decarbonisation of the electricity markets (and heating, industry and transport – this is quite serious) to take place, a limited number of options are available. Arguably, the technical challenge is: how to use overcapacity (if this is indeed what occurs as more renewables are built) or, going further, what are the financial hurdles involved with adding large-scale storage that can then be used in other sectors (for example; industry is a prime candidate). As I explain, it may be useful not to consider interconnections as a panacea, as a) governments may be unwilling to do this b) its limited in the capacity that can be successfully transferred between nations, due to the high cost of HVDC cables, their intrinsic 1-2GW limit, and very large capacity demands that will be needed at a high RES share within any one countries’ electricity mix. In fact, I think it is quite easy to see that the most cost-effective answer is to overbuild renewable energy sources, and then first use this extra capacity to decarbonise existing hydrogen users (ammonia, refineries, chemicals), then other large industrial users (steel, concrete) and finally start engaging with the residential heating and dispatchable power markets – by feeding hydrogen to the gas grid and into gas turbines etc. A large number of major reports have found conclusively that hydrogen via demand response (or perhaps imported natural gas with the added costs of SMR and CCS on top of this) is the only way to decarbonise these sectors – there is most certainly no other form of large-scale storage or dispatchable power. Yes – my company working with others came to the same conclusions re H2. It is, more or less feasible right now. That said – the post might have been better somewhere else. Everyone seems to have an opinion, like I told my husband that I wanted to get into trading he just about had a stroke by the way he acted about it, but now that I found the Emini S&P Trading Secret I’m making more money than he is 🙂 Now he’s like go girl, hahaha. “Germany is sceptical of any such move (to 45%) , fearing for the competitiveness of its export-dependent industry” – I don’t deny that “germany” (aka Mutty merkel) is worried – however, given renewables in the right location for the most part are at grid parity it is difficult to see how this would impact on exports – if a kWh of electricity costs the same from a wind turbine or a gas-fired power station what is not to like? Thus the German response to the 45% seems……….irrational. This is supported by comments from Altmaier (aka Der-Dikke) “unachievable targets” oh come on fatso – how would you know if they were achievable or not? (they are). As noted in posts elsewhere – German voters would do themselves a favour by getting rid of has-beens and never-weres such as Altmaier – career politicos who have long past their sell-by date. That they do not is a mystery. As for (non)BusinessEurope, the great puzzle is – why do they still have members? Interesting to see that they support secrecy e.g. “challenge the need for more transparency” after all as a courtier you would want to control the flow of info and the background – wouldn’t you? However, it was good to see that (n)BE kept the best till last: “to make our transition in Europe a success…. we need stability to mobilise investments”. So we need stability – stable in what terms? BAU? that kind of stability? To mobilise investments you need targets, long term targets, multi-decadal targets, targets that are “baked in” and targets that are ambitious – you know that get the wheels of industry turning – “steady as she goes” does NOT do that.. The arguments about cost, as wheeled out by the Germans (& used by nonBE) are delaying tactics used by those that just wish climate change would go away – almost like small children “mummieeee… please make it go away”. Well boys (& it’s mostly boys) I ain’t going to “go away” & if you ain’t going to step up to the plate – then get out of the way – cos there are others (men and women) that have both the brains and the will to make it a success i.e. a zero carbon Europe by 2050 with prosperous citizens. & to finish, echoing Cato: BusinessEurope delenda est.